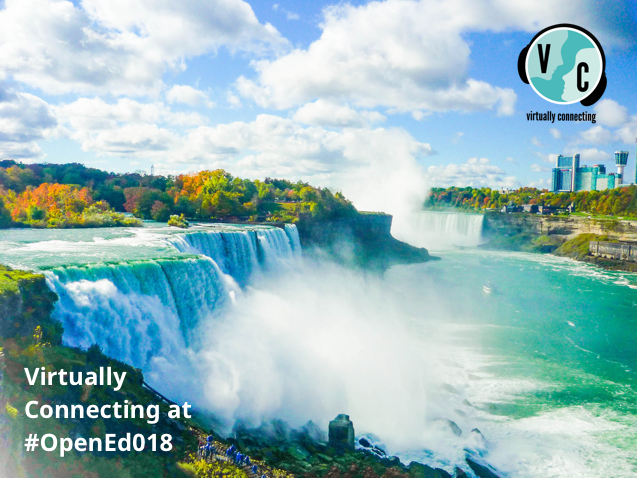 We’ve been Virtually Connecting from OpenEd 2018 (#OpenEd18), an annual event now in its 15th year dedicated to exploring open pedagogy, practices and resources, held in 2018 in Niagara Falls, New York, USA. Explore the conversations below with some of the folks who attended #OpenEd18, including keynoters Jess Mitchell and MJ Bishop, and other special onsite guests Angela DeBarger, Cheryl Hodgkinson-Williams, Glenda Cox, Hengtao Tang, Johanna Funk, Kristina Ishmael, Marjon Bass, Olawale Iyinolakan, Paul Bond, Tomohiro Nagashima, and Tutaleni Asino, or visit the playlist of all five sessions. Huge thanks to the volunteers that made Virtually Connecting at #OpenEd18 possible, including Alan Levine, Autumm Caines, Christina Hendricks, Helen DeWaard, Joe Murphy, Ken Bauer, Terry Greene, et al and of course Maha Bali. Our deepest gratitude to the OpenEd Conference, David Wiley, Julie Curtis and all the sponsors for making a special place for for Virtually Connecting at #OpenEd18. You made it possible for us to offer radical hospitality to folks from around the world to engage with people and ideas onsite. We are proud to present onsite guests #OpenEd18 keynoter MJ Bishop (@drmjbishop), Associate Vice Chancellor and Director of the University of Maryland’s William E. Kirwan Center for Academic Innovation, Tutaleni Asino (@tutaleni), Assistant Professor, Educational Technology, and Director, Emerging Technologies and Creativity Research Lab at Oklahoma State University, and Hengtao Tang (@Happy_Tao), Educational Technology Researcher & Instructor at the University of West Georgia. Slides and a recording of MJ’s keynote should be available eventually on the #OpenEd18 website. The conversation was coordinated by Virtually Connecting’s onsite buddy Nate Angell (@xolotl), from Hypothesis, with virtual buddy Helen DeWaard (@hj_dewaard), from Lakehead University. We are proud to present onsite guests Marjon Baas (@oerbaas), Olawale Iyinolakan (@OROAWaleIyin), and Tomohiro Nagashima (@tomonagashima), all @GOGN_OER graduate students who received scholarships coordinated by Virtually Connecting to help make it possible for them attend #OpenEd18. The conversation was coordinated by Virtually Connecting’s onsite buddies Christina Hendricks (@clhendricksbc), from the University of British Columbia, with virtual buddy Helen DeWaard (@hj_dewaard), from Lakehead University. We are proud to present onsite guests #OpenEd18 keynoter Jess Mitchell (@jesshmitchell), Senior Manager Research + Design at OCAD University’s Inclusive Design Research Centre, Johanna Funk (@johannafunk1), Research Associate & PhD Candidate at Charles Darwin University, and Paul Bond (@phb256), Assistant Librarian at SUNY Broome Community College. View the slides from Jess’s keynote and a recording should be available eventually on the #OpenEd18 website. The conversation was coordinated by Virtually Connecting’s onsite buddy Nate Angell (@xolotl), from Hypothesis, with virtual buddy Alan Levine (@cogdog), who participates in too many things to sum up in a few words. We are proud to present onsite guests Angela DeBarger (@AngelaDeBarger), Education Program Officer, The William and Flora Hewlett Foundation, and Kristina Ishmael (@kmishmael), Public Interest Tech & Ed Policy Fellow, New America. The conversation was coordinated by Virtually Connecting’s onsite buddy Nate Angell (@xolotl), from Hypothesis, with virtual buddy Joe Murphy (@joefromkenyon) from Kenyon College. We are proud to present onsite guests Cheryl Hodgkinson-Williams (@CherylHW), Associate Professor, and Glenda Cox (@Glencox), Senior Lecturer: Curriculum Projects, both at the University of Cape Town’s Centre for Innovation in Learning and Teaching. The conversation was coordinated by Virtually Connecting’s onsite buddy Christina Hendricks (@clhendricksbc), from the University of British Columbia, with virtual buddy Alan Levine (@cogdog), who participates in too many things to sum up in a few words.